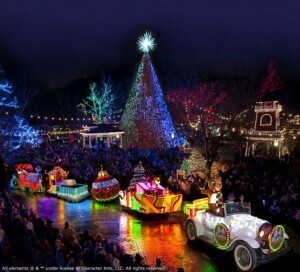 Silver Dollar City has always been well ahead of the pack in terms of theme park Christmas events. SDC’s annual Christmas spectacular, An Old Time Christmas, has been running since 1991 and has always boasted huge crowds. Other park operators stood by and took notes, but the logistical challenges of extending the season, hiring an additional round of seasonal workers, and coordinating the millions of lights and decorations proved too much for most parks… until recently. Over the past five years or so, nearly every major park in the country has finally gotten up to speed with Christmas events – heck, even Frontier City is planning one for next year. Still, the vast majority still fall well short of what SDC has been offering all this time. The most obvious attraction has always been lights. Back in the 1990’s the millions of lights plastered all over the city was unprecedented in this area and dropped plenty of jaws. These days its a lot “easier” to come up with big light displays, but Silver Dollar City is upping the ante by boosting the light count from 4 to 5.5 MILLION lights this year. The vast majority of those extra 1.5 million lights are being added to a concentrated area within the park known as Midtown. The display has it’s own identity as Christmas in Midtown and includes special entrance ways, brighter and more tightly packed lights, and dazzling overhead displays. There are obvious parallels to the old Osborne Lights displays that Disney World used to setup, but SDC’s version is custom made for the park. As if all that wasn’t enough, there’s even a special parade with miniature light floats that squeezes through the city twice a night. Some of the mega parks now have bigger light numbers, but the setting of SDC’s lights within the woods and the rustic 1880’s buildings really enhances them. The Christmas stage shows at Silver Dollar City are worth the ticket price into the park by themselves. SDC’s rendition of Dicken’s Christmas Carol draws massive lines (fortunately the theater is pretty huge) and always gets a standing ovation. Across the park is the equally elaborate It’s A Wonderful Life. Both of these shows far outclass anything I have ever seen performed at any other theme park. We aren’t talking a holiday skit from theater kids here, these are actual professional productions with experienced actors, elaborate sets, and broadway quality. On the subject of shows, there’s also a living nativity, a singing Christmas tree show for the kids, a special edition of the famous Saloon show, and best of all: the elaborate light and music show on the main square featuring a five story Christmas tree. Silver Dollar City’s feel-good, semi-historical, partially tongue-in-cheek 1880’s setting feeds into the classic Christmas feeling, and there’s some things that just plain present themselves better this way. Take for instance the Frisco Sing-Along Steam Train, which is always a heartwarming experience complete with a special presentation half-way along the journey. There are other train rides through lights out there, but none will leave an impression on you like this one. Then there’s the roaming carolers, the classic Christmas foods, and even Santa himself that just fit right in with the old-time Christmas atmosphere. Don’t forget that ALL of Silver Dollar City’s dry rides operate during the Christmas season (temperature dependent), rather than the typical small selection you’ll see at other parks. Night rides on Outlaw Run are legendary, and we can’t wait to experience next year’s new extreme spinning coaster, Time Traveler, in the cold and dark with all the lights around. So while other parks now offer light displays at Christmas time, no one is coming close to offering the Old Time Christmas experience that Silver Dollar City has been perfecting for over 25 years. It is worth the journey to experience for yourself! Check out the full details of An Old Time Christmas here on the official site.